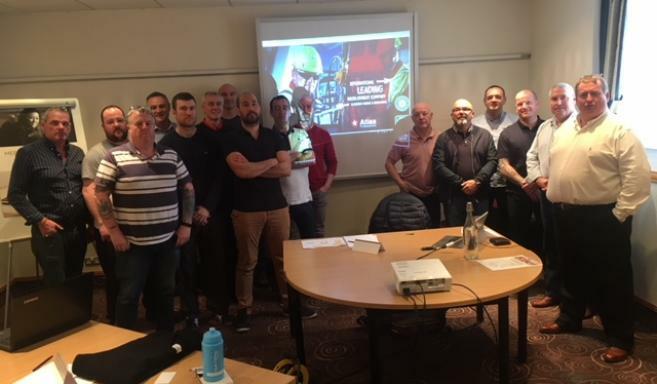 On 16 and 18 April, Atlas Professionals’ Senior HSEQ advisor Mark McDonald and Drilling Team Leader Alex Palla from the Atlas' Aberdeen office held a Re-entrant Safety Training session in Glasgow and Aberdeen for professionals that had been out of the industry for up to three years due to the downturn. participated in the event. “These events ensure that personnel are not returning to the industry “Rig rusty” and are refreshed in certain aspects of offshore live”, says Mark. “All of the participants of the course are hopeful of getting back into employment through Atlas very soon”. During the Re-entrant training the attendees were given training and information in topics including Safe Behaviour, Risk management tools, Prevention in Hand and Finger injuries and Dropped objects. Next to this also information is presented about Atlas Professionals OPITO approved skills assessment and competence and Atlas’ Zero Harm policy. Each professional also had a one to one with Drilling Team Leader Alex Palla, who ran through their CV’s and advised them on what training was required (if any) to help them gain employment. And successful because within 24 hours, we are happy to announce to that one of the professionals who attended has already been accepted to work for one of our clients and will mobilise to one of their MODU’s on Wednesday 18th April.